We did not meet last week due to the Independence Day holiday, so it’s been two weeks since our last meeting and great progress has been made! 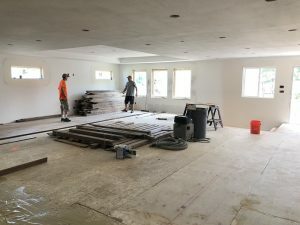 As a follow-up to my last post, the great room windows have been moved up and the interior drywall patched. The interior has also been primed. 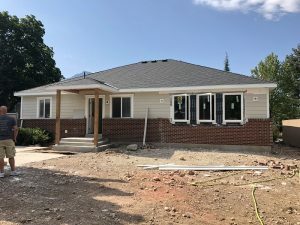 The exterior siding and brick still need to be patched. The windows line up much better! The hardwood was delivered and left for a week to acclimate. 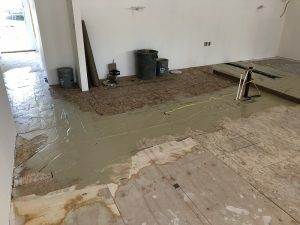 The flooring company has done a final round of floor leveling and started installing the hardwood. It is very exciting to see the first of many finish installations begin and the hardwood looks amazing! The interior designer will meet Jon, Marisa, and the painter on site in the next week to pin down a color for the stain.